It is getting dark outside, and Nicholas’ cat is on the roof - she won’t come down. He climbs a rickety ladder to try and coax her inside, but she runs away. He warns her of the ghosts, monster and creepy crawlies that come out at night, but she doesn’t budge. Defeated, Nicholas goes to bed, tossing and turning while worrying about his poor cat stuck outside. It is only when it starts to rain that the cat miaows to come inside. Will Nicholas be brave enough to face the rain and darkness to save his cat? 'Come Down, Cat!' is a heartwarming story about overcoming fears for the ones we love. It is a fantastic book to encourage speech and language development, winning the Speech Pathology Australia Book of the Year Award in 2012. The rich descriptive language used throughout encourages children to engage with the book while forming vivid mental images of the events in the story. 'Come Down, Cat!' has a true narrative structure which makes it an excellent choice for targeting sequencing and narrative retell skills. It models a range of interesting action and mental verbs (e.g. think, remember), which children can practise including in their retells of the story. 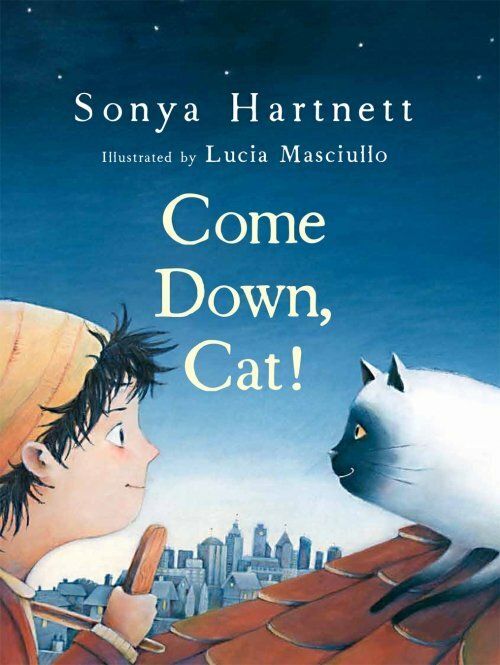 For further speech and language targets in Come Down, Cat!, see the list below.